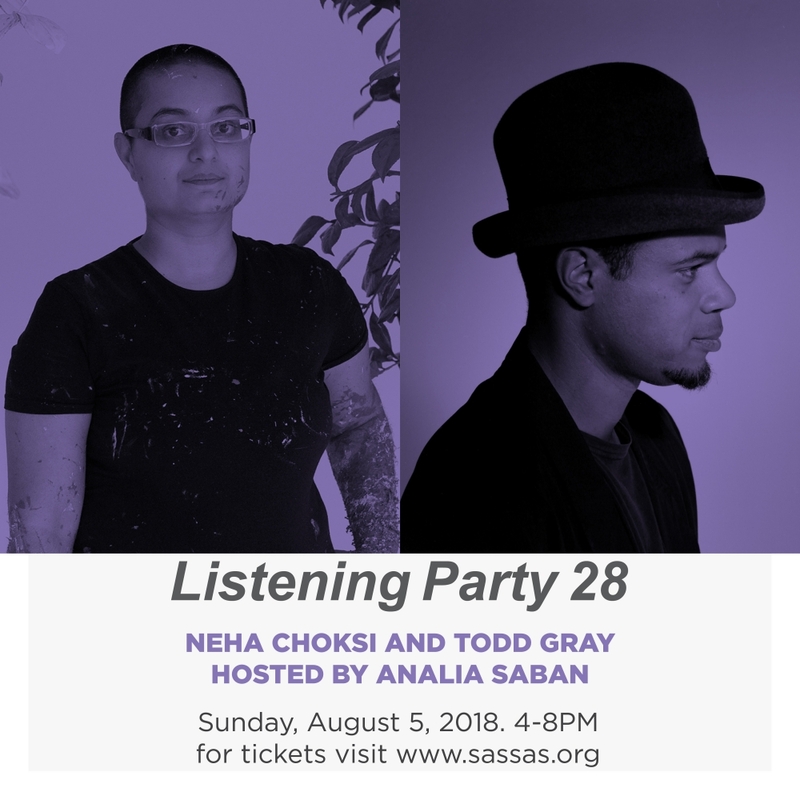 Join SASSAS and host Analia Saban for dinner, drinks and conversation as artists Neha Choksi and Todd Gray share their favorite tunes at Listening Party 28 on August 5. Analia Saban's home is located in the historic West Adams neighborhood of Los Angeles -- address to be provided with ticket purchase. Proceeds go to SASSAS and the sound. concert series. For this Listening Party only, we are offering special tickets which include a copy of SASSAS Record 1.3 featuring a 12.5 x 25 inch limited edition print by Analia as its cover! *Neha Choksi* is an artist who works in multiple media, across disciplines and at times collaboratively and in unconventional settings. Choksi has current and upcoming exhibitions at the Hammer Museum (biennial, 2018); 18th Street Arts Center, Santa Monica (commission, 2018); University Art Museum, CSU Long Beach (solo, 2019). Her work has been exhibited or performed at Dhaka Art Summit (commission, 2018); Manchester Art Gallery (solo, 2017); LAMOA at Occidental College, Los Angeles (solo, 2017); 20th Sydney Biennale (commission, 2016); Hayward Gallery Project Space, London (solo, 2015); Kochi-Muziris Biennale (2014); Armory Center for the Arts, Pasadena, California (2013); Whitechapel Gallery, London (2013); John Hansard Gallery, Southampton, UK (3-person, 2012); Asia Pacific Triennial, QAGOMA, Brisbane (2012); Shanghai Biennale (2012); Wanås Foundation and Kristianstads Konsthall, Sweden (2012); the Venice Architecture Biennale (2006); among others. She was awarded the India Today Best New Media Artist of the Year Award in 2017 and the designation of Cultural Trailblazer by the City of Los Angeles DCA for 2017/2018. She lives and works in Bombay and Los Angeles. A book on one of her works was published this year by Hesse Press. She serves on the editorial board of X-TRA. *Todd Gray* received both his BFA and MFA from the California Institute of the Arts (CalArts). Solo and group exhibitions include the Studio Museum, Harlem, NY: Renaissance Society, University of Chicago; National Portrait Gallery, London; Grand Palais, Paris among others. Performance works have been presented at institutions such as the Roy & Edna Disney Cal/Arts Theater, REDCAT; and the Hammer Museum, Made in LA, Los Angeles. His work is represented in numerous museum collections including the San Francisco Museum of Modern Art; Los Angeles County Museum of Art; National Gallery of Canada; Studio Museum in Harlem; Museum of Contemporary Art, Los Angeles among others. Gray had a solo exhibition My Life in the Bush with MJ and Iggy at the Museum of the African Diaspora, 2017, in San Francisco. He was the recipient of a Rockefeller Foundation Grant in 2016. Todd Gray’s photo based work explore issues of black masculinity, diaspora, and contemporary/historical examinations of power. In recent installations he revisits this archive, pairing his images of Michael Jackson with photographs of Ghana where Gray maintains a studio, exploring the diasporic dislocations and cultural connections which link the US to West Africa. Gray has presented this work in academic conferences at Yale and Harvard University and is a 2018 John S. Guggenheim Fellow. *Analia Saban* dissects and reconfigures traditional notions of painting, often using the medium of paint as the subject itself. Blurring the lines between painting and sculpture, imagery and objecthood, her work frequently includes plays on art historical references and traditions. Paintings expand to sculptural forms and sculptures are presented in two dimensions, using the process of trial and error with new techniques and technology. Her unconventional methods such as unweaving paintings, laser-burning wood and canvas and molding forms in acrylic paint remain central to her practice as she continues to explore art-making processes and materials in relation to her daily experience. Dealing with issues of fragility, balance, technique and experimentation, Saban's connection with everyday objects is at the forefront of her investigation of tangible materials and the metaphysical properties of artworks.